November is the perfect time to reflect on what we have and to appreciate those in our lives who support us. Before we get caught up in the pressure to buy things advertisers and the media say we need to be happy, let's spend the next thirty days focused on defining our needs, truly seeing the extraordinary in our everyday, and adopting a mindset where we look for the positive in our daily life. "I'll be happy when [INSERT WANT HERE] happens." Few of us are immune from it. And it's dangerous thinking. Why is it dangerous? Because you're looking outwards instead of inwards for happiness. And worse, you're ignoring what you have today. This thinking is why I created the Have not Want Challenge in 2012. As a new mom, I was incredibly focused on trying to be in the moment with our six month old daughter Gates. I began valuing time more than money and thinking of choices in terms of time tradeoffs. And, I realized I was spending a lot of my time unhappy, waiting for tomorrow. Join me in being thankful for what we have today. Let's let go of expectations that maybe we can be happy if we just had [INSERT WANT HERE] tomorrow. This November take the Have not Want Challenge with me. Work through all focus areas of the Have not Want Challenge or pick and choose the areas that best suit your needs. I'm super excited about the challenge this year and hope you'll be participating too! Like last year, anyone who participates on social media and uses the hashtag #havenotwant_trttgl will have a chance to win a gift card for turning their Instagram photos into a photo book. This year you can win 1 of 2 $20 gift cards from Artifact Uprising, enough for a 5.5 inch by 5.5 inch 40 page Instagram Friendly, Premium Quality Softcover photo book. All subscribers will also have a chance to win. Focus on Spending: be conscious of how you're spending your money. I was curious what we as a family really needed to be happy. What in our life was a "must have" (shelter, food, and capsule wardrobe) versus a "nice to have" (jewelry and home decor). In 2012 when I started this challenge I'd fallen into the habit of buying things to treat myself when I had a bad day a work, things that often remained in my closet with the tags on for months, if not years. I realized these impulse purchases weren't making me happy and were sabotaging my future. To change this I needed to become a mindful consumer. The following steps are designed to focus our thinking on why we're buying and to start taking control back from advertisers and the media. Identify what you plan to purchase for the month and write everything down. Label everything either essential (your must haves) or nonessential (your nice to haves). For both essential and nonessential spending, group related items into categories of spending, for example, Food, Clothing, Entertainment, and so on. Record each personal or nonessential item that you buy and its cost. Clothing, makeup, accessories, home decor, gadgets, etc. are counted. Food, garbage bags, cleaning supplies, etc. aren't counted. Note down what the item you wanted cost, including sales tax. Tally your "true" savings for November. Sum up all of items you didn't purchase to calculate how much you saved. Unlike "savings" from retail sales, this translates to an increase of actual money in your savings account. Focus on Appreciation: recognize what you have and what you truly need to be happy. I learned I needed to change my thinking, to start seeing the haves in my life and to recognize how the seemingly ordinary in my life made it extraordinary. In 2013, I expanded the Have not Want Challenge to include prompts to encourage taking a deeper look into your life, to discover what makes you happy, and to appreciate your haves. This year's prompts dive into six aspects of our every day life: our surroundings, ordinary objects, undervalued gifts, rituals, connections, and paths not typically taken. 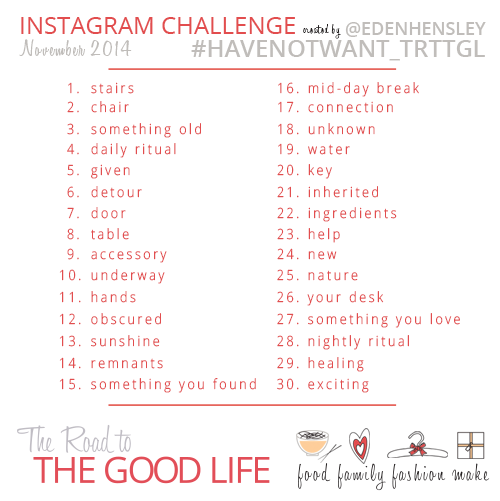 Each photo tagged #havenotwant_trttgl and shared on Instagram throughout the month of November (photos shared after 11:59PM on November 30th 2014 won't be eligible) will be entered into a random drawing along with challenge subscribers and any Tweets or Facebook posts tagged #havenotwant_trttgl. Winners will be chosen using random.org. If two photos or updates from the same person are chosen, I'll draw another random number to find a second winner. Will you be joining me for the Have not Want Challenge?